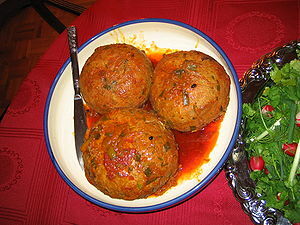 Kufteh Tabrizi (Persian: کوفته تبریزی‎), also known as Tabriz Köftesi, (Azerbaijani: Təbriz küftəsi) is an Iranian meatball recipe from the city of Tabriz. The dish normally includes a big meat ball with meat, rice, yellow split peas, herbs and other ingredients and its juice which is served in a separate dish with shredded Sangak or Lavash bread before the main course. The ingredients are ground beef, rice, yellow split peas, leeks, mint, parsley, onion, and Persian spices for the dough and boiled egg, walnut, fried onion, and dried apricot for the core of the Kufteh. Boil rice and split peas separately each for fifteen minutes. Cut one onion in small pieces and fry it in vegetable oil. Mix and cut all of the vegetables into small pieces. Grate another onion in tiny pieces and drain out its juice. Mix all ground beef, ground onion, boiled rice, boiled peas and vegetables with Azerbaijani spices and salt and squish them all. Make a ground ball of the pulp and put the apricot, and boiled egg in the middle. Add tomato paste and barberries to the frying onion and fry for couple of minutes again then pour water inside it and heat it up till it boils. Carefully put the meatballs inside the boiling mix and keep it boiling for half an hour. Tabriz Köftesi or Kufteh Tabrizi means meatball of Tabriz. The word is derived from Kūfteh: in Persian, kuftan (کوفتن) means to beat or to grind. ^ Alan S. Kaye, "Persian loanwords in English", English Today 20:20-24 (2004), doi:10.1017/S0266078404004043. This page was last edited on 19 December 2018, at 19:52 (UTC).